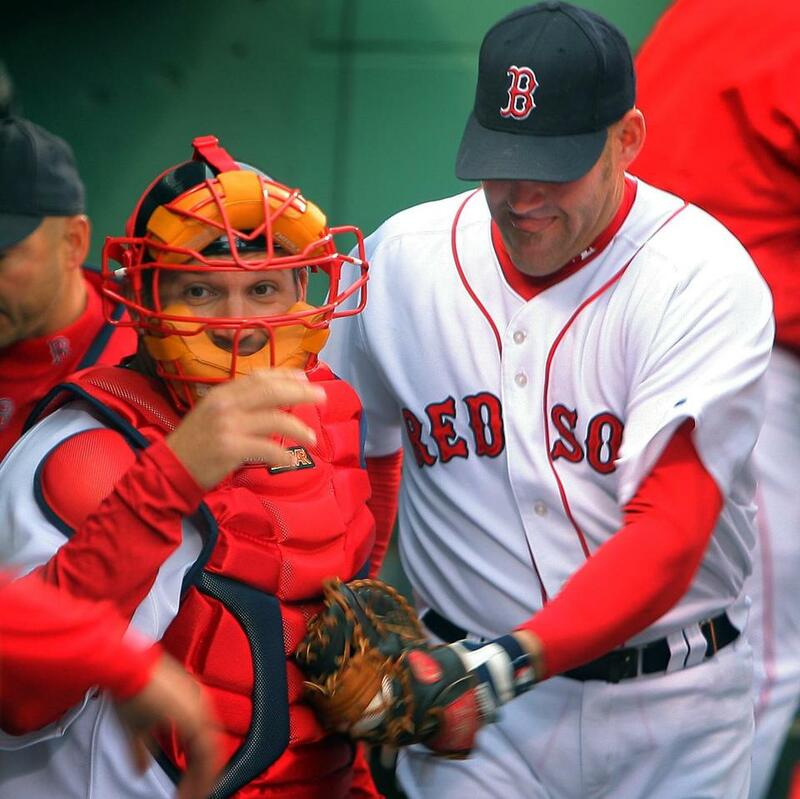 Kevin Youkilis (right) welcomed catcher Doug Mirabelli back after he arrived just minutes before game time. You fly all day. You are picked up on the tarmac by a police car. You change in the back seat, arriving at Fenway Park in record time, with sirens blazing. You throw on your equipment, head out to home plate, and there stands Johnny Damon, your old teammate. And 60 feet 6 inches away is Tim Wakefield, whose mystifying knuckleball has just drastically altered the lives of two catchers, yours and the guy you’ve been brought back to replace. Oh, and have we mentioned it’s the first Red Sox-Yankees game of the season and there are 36,000 people screaming on every pitch? “I don’t think I’ve ever been that nervous for a ballgame ever in my career,” said Doug Mirabelli, who is 34 and generally as unflappable as they come. The last man he caught was a kid named Clay Kingsley, who has a pretty standard repertoire. “Good sinker, curveball, slider. Good stuff,” Mirabelli noted. Good stuff, and all standard. He could catch Clay Kingsley standing on his head. But here he was, without benefit of anything resembling a warmup and not having seen a knuckleball since last fall. If there ever has been a more daunting situation in the history of baseball, would someone please suggest it? That was beyond fictional. One of the weirdest moments came on the game’s first at-bat when he realized that the Yankee leadoff batter was Damon. “I hadn’t really thought about that,” he said. He, of course, was the only person in the ballpark who hadn’t. “Johnny just said, `Welcome back,’ “ Mirabelli reported. But that was then and this is now and he is the acknowledged master of catching the knuckleball. So that was the start of his welcome back to Boston. Riding in a police car was another highlight. “Have you ever ridden in a police car before?” he was asked. “That was the first time naked,” he replied. All this because of a knuckleball. Wakefield had better be buying for a while.